Mange your business, not your WiFi. Manage your business, not your WiFi. Speak to a Shaw Business representative today. promo rate on a 3-year term. Analytics provide insights into traffic patterns to help you increase sales. 80,000 Shaw Go WiFi hotspots. Get Cisco® Meraki® enterprise-class access point and an Advanced Hitron Modem included, plus 24/7 support. Literally put your business on the map and join a network of over 80,000 Shaw Go WiFi hotspots. 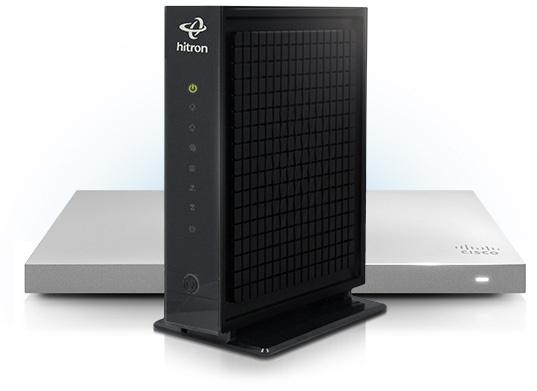 Advanced Hitron Modem included, plus 24/7 support. ± Savings based on regular rate of SmartWiFi 75 ($119.95/mo, one-year term) compared to promotional offer ($80.00/mo) on a three-year term.